For a time when I was a toddler, my mother kept me on a leash during our city outings. It made perfect sense: I was quick and dumb and liable to run into traffic at any moment, whereas she had little mobility and poor eyesight. But leashes are frowned upon these days. Perhaps it’s that people find the image disturbing. Strapping your able-to-walk child into a prettified wheelchair however is still okay. We worry so much about perceptions, don’t we? Television is bad for young children. The image of the wee things sitting passively, and often too close, in front of the screen is shorthand for mediocre, absentee parenting and an under-stimulated child who’s not going to develop at pace. But if it’s a video going by the name of Baby Einstein, or Baby Mozart, then it’s a learning opportunity. And you wouldn’t want your infant to lack for those, would you? Parenting has always been about fears and insecurities, of this I am quite convinced. They are just different fears nowadays. If the issue is that we have become afraid for their safety, then why are leashes frowned upon? Perhaps the true nature of our concern is somewhat displaced. Perhaps fear for the child's safety is just as much fear of the great Outside. How will our child measure up? According to the broadly dominant Western rearing model, as parents we are supposed to always be there for our child and fulfil their every emotional and developmental need, which in turn is supposed to make them wonderfully balanced, secure and self-actualised beings, capable of handling themselves in complex social situations from an early age. Yet these adults-in-the-making are less and less often allowed to even leave the house. But what if this is not so much about safety as it is about control? In order to explain what I mean, I must first of all take a little detour. 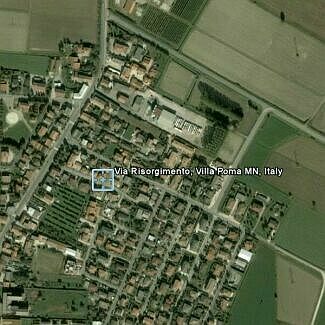 I grew up in Milan but also spent a lot of time as a child at my maternal grandparents’ place, in a small village 40 km outside of Mantua. 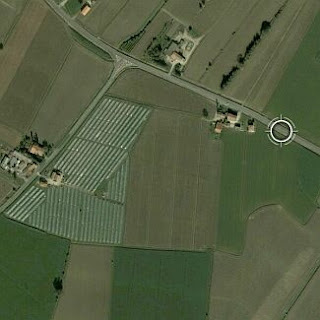 The first thing I did when I discovered Google Earth, was to explore those old haunts from the air. When I wasn’t visiting friends or playing football in the street, there was one route in particular that I especially liked to take on my bike, so I followed that. It started here. 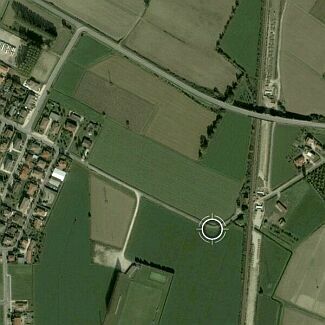 turning east at the crossroads, and proceeding all the way to Magnacavallo. In Magnacavallo they had a café with better videogames and a newsstand with a wider selection of comics. All of nine or ten years old, I’d be away most of the afternoon, and none of the adults in my family would know where I was. I wasn’t supposed to actually be there, granted, but I could have gone just as far in other directions without crossing the railway, and the fact that my broad whereabouts would be unknown for hours on end was acceptable, normal. When I first retraced those steps in my thirties by means of Google’s wonderful satellite images, I was frankly a little shocked at how far that was. And it felt perversely as if I was spying on my childhood self. I know what you did all those summers ago. We can map these things now, we can visualise them in many more different ways, and with much greater precision and granularity. Have our perceptions of ourselves in relation to the Outside changed as a consequence? There you have it, a wonderfully literal image of helicopter parenting. And it doesn't matter that most of us would shudder at the thought, or that we would never do it – that these devices are available contributes to define contemporary parenting and wider social relationships in itself; it's an index of the reality we have to navigate. Besides, there are several instruments of surveillance and self-surveillance – ostensibly more benign in that individuals are supposed to engage in them willingly – which suggest that the Spark Nano is not an aberration but actually sits at one end of a continuum. 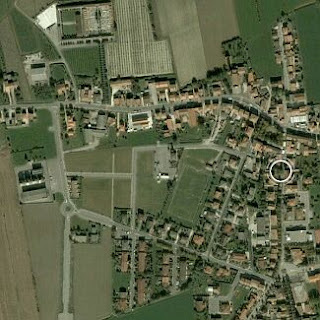 There is Foursquare, for instance, the geosocial networking tool for mobile devices that allows users to connect with friends and update their locations in real time; or the similar but more family-centred Latitude, a Google application that enables users to keep track of each other’s whereabouts using ordinary cell phones as GPS receivers. Here’s an excerpt from a brief CBS video report on Latitude. Reporter’s voice: And sometimes the parents don’t know where fourteen year old Jordan or sixteen year old Carly are hanging out. So that’s the problem: keeping constant tabs on your children, whom have just been described as having some independence and who are already equipped with cell phones, but evidently cannot be trusted to respond to calls or messages, or keep you reliably informed in real-time of their plans for the day. There are a couple more interesting moments in the video: the reaction of the parents when the reporter informs them that the girls would be able to block other users, i.e. them, if they so desire (the mother, evidently displeased: “Oh, really?” the father, in the form of a wonderfully awkward joke: “Don’t tell them!”); and later the suggestion that there are circumstances in which the girls might have an interest in knowing the parents’ whereabouts too. So maybe it’s not quite as simple as parents wanting to keep a watchful eye on the children, and our kids are as much prisoners in their own homes as the parents are imprisoned by them: always required to nurture-on-demand (especially Mum, of course), always supposed to be in the picture themselves. And isn't the baby monitor actually a parent monitor, calling us to task? By the time the kids leave home, they have interiorised this need to know where everybody is at all times to the point that it’s become a reflex, and they’re ready to treat their friends that way too and evolve into fully geosocial beings. What all these devices and applications underscore very forcefully is how our technologies of memory and communication are increasingly also technologies of surveillance, and that the relevant segment of the consumer electronics market is involved in an incredibly complex enmeshing of social attitudes and behaviours. As is almost always the case, I am not claiming to be immune to this. 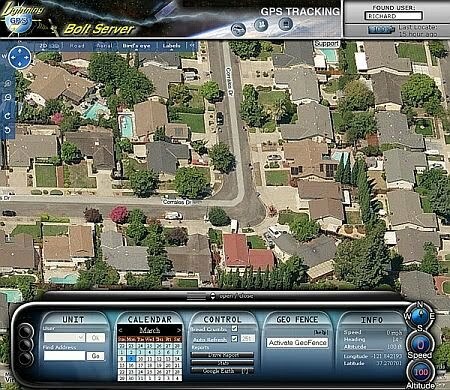 I can see the appeal of personal GPS devices, in spite of the fact that the question ‘where am I’ can be generally answered without reaching for one’s iPhone; and, more to the point perhaps, I’m no less anxious than the average parent regarding the whereabouts and well-being of my children. In fact this post was quite possibly inspired by my recent experience of sending Joseph off on his own for the first time to a football practice and then a game in the space of a few days, on both of which occasions I was very sharply aware of our un-tethering. However I do think we really ought to examine this enmeshing, tease out the strands that lead us towards the madness of planting bugs on the kids’ clothes, and reflect not just on the overt aims and operation of these devices, but also on their language and their imagery, and what they say about our culture. Take this picture for instance. It’s a frame from Tony Scott’s 1998 film Enemy of the State, from a scene in which the NSA is attempting to track down and assassinate the character played by Will Smith. Now look again at the first image of my grandmother’s village above. Do you see it? It’s the cross-hairs, again. You can take it simply as a reminder that all of these technologies – hell, even the Internet – used to have military applications, and contend that it’s an insignificant, vestigial detail; or you can be a little more cautious, a little wary that the wholesale adoption of this visual vocabulary might have deeper psychological resonances, suggesting that perhaps our need to know, our need to see where our loved ones are at all times could also be an aggressive form of control – even when we turn it onto ourselves. People who came to these things didn’t know how to listen any more, couldn’t concentrate, had no language for evaluating the specific, only the capacity to wander through post-modernity in a state of vacancy. Look around. Every second person in the street or on the bus is listening to their own sounds. It’s an experience we take for granted, a modern convenience, that we can choose to listen to music or podcasts instead of the acoustic texture of our environment - the voices of the city, the noise of the city. Every second time I leave the house on my own, I’m one of those people. Between April and May there was an interesting coincidence of sound exhibitions in Wellington. 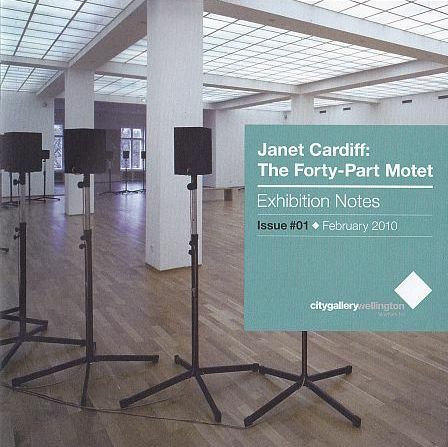 At the City Gallery, Janet Cardiff’s flawless Forty-Part Motet. At a temporary gallery in Willis Street, Dugal McKinnon’s strident Popular Archeology. In almost every respect, each exhibition was the opposite of the other, yet they both reflected on the historical nature of sound, its recording and its reproduction in a surprisingly convergent way. For the Motet, Cardiff took a recording by the Salisbury Cathedral Choir of Thomas Tallis’ forty-part choral work Spem in alium nunquam habui and arranged for each part to be played via a separate speaker within the gallery. Mounted on poles, the speakers are set at the approximate height of the singers' heads, so their physical arrangement resembles a curiously anthropomorphic grove. But by far the overwhelming sculptural element of the work is the sound itself, which fills the exhibition space with almost intolerable clarity and force. Sitting on a bench, at some distance from the speakers, one could pretend to be at a performance of Tallis’ motet, but that’s the least interesting way to appreciate Cardiff’s work. It is far more tempting, irresistibly so, to wander amongst the speakers, to stand next to each of the singers, your ears to their ‘mouths’. What you get then is a distorted version of the piece in which the part sung by the chorists close to you are foregrounded, and the composition is bent out of shape. The effect is truly startling. Imagine what it would be like to be allowed to move amongst the singers in a choir, put your ear literally to their mouths and yet have them continue singing, unperturbed. Or to move in an orchestra pit, watching each note as it leaves a string, or a key. Besides the surreal intimacy, you get a feeling of how sound occupies its environment, and that there is no such thing as an objective, correct manner in which a composition or, for that matter, a conversation is supposed to sound. It depends on where you’re sitting, on whom or what you’re paying attention to. The arrangement of the Motet at the city gallery was aseptically lavish, a thing of precision and sombre beauty. White walls, the forty identical, expensive-looking speakers playing the composition in a continuous, identical, carefully timed 15-minute loop. Meanwhile, down in Willis Street, in a temporary gallery reclaimed from a vacant commercial property, composer Dugal McKinnon placed thirty-five old tape recorders on a row of Lundia shelving and pressed ‘play’ on a selection of vintage pop ca. 1967 to 1994. If the stream of sounds produced by the installation was ever deliberately designed to produced a specific effect when it was first set in motion, that effect would have quickly dissipated. The different duration of each of the tapes, as well as the nature of the equipment, conspired against anything resembling a repeated precision performance; moreover, the visitors were encouraged to intrude in the selection by bringing their own tapes, some of the original tapes snapped and some of the players started malfunctioning along the way. By the time I visited it, McKinnon’s installation sounded like a protracted pop wail. 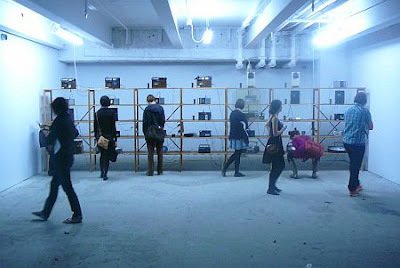 But its aim was never aesthetic: beginning with the title - Popular Archeology: a Sound Archive - the show posed questions about how we relate to our immediate cultural and technological past. Both nouns in that title must be understood ironically: the time frame, falling as it does within the lifetime of most people who are alive, cannot possibly refer to an actual archaeology, nor does a temporary and arbitrary collection of musical artefacts constitute a proper archive. But then it's hard to look at a row of tape decks and not reflect on how old that technology already seems, as does the music itself, in an industry that thrives on nostalgia but also on the constant injection of the new and on the abuse of words like classic to describe the hits of last summer, or the last decade. The word archive, too, hijacked by the jargon of personal computing, has come to mean everything and nothing, and no longer speaks of a serious attempt to preserve specific content along with information about its context. Music, then - but the same could be said of other media - is ejected out of history, and a piece composed in the mid 1570s can be made to sound and even look more contemporary, more of this moment, more culturally relevant than yesterday's pop. 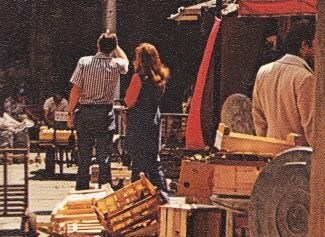 Yet in the five hundred metres or so that separated the archaic cacophony of Split Enz and Sade from the digitally rendered modernity of Tallis' motet, there was something else: three or four blocks of city streets, an immersive space routinely criss-crossed by people who would rather listen to their own sounds. Is there a voice, is there music in those city noises? Are they themselves worthy of preservation? Canadian composer Raymond Murray Schafer, author of the seminal The Tuning of the World, famously thinks so, and his ideas are still pursued three to four decades after their original formulation by means of projects - like the ongoing acoustic mapping of the city of Catania conducted by the Sicilian Soundscape Research Group - that seek to make fundamental value judgments about what constitutes meaningful sound as opposed to aural pollution. As researcher Stefano Zorzanello has explained, this value is to be found in the distinctiveness of an acoustic environment, in its unlikeness, whereas by contrast we ought to regard as noise the sounds that are the same everywhere - be they the drone of air conditioners and power lines, or the more textured din of peak-hour traffic. 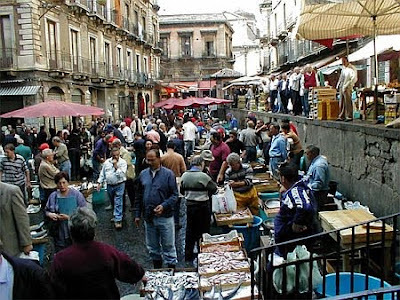 Here is by way of example the sound of a Catanese fish market. If you do bother to click on the link, don’t worry that you cannot understand what is being said - neither can I. The value of the recording, if it does indeed have one, is not in its spoken content, but in that it preserves the unique acoustic signature of that place at that time; a signature that, if it is accompanied by the necessary contextual information, can become a social and historical document. I am not aware of any well-developed projects of this kind in Aotearoa, but it seems to me that they would fit quite well within local shared knowledge models such as Kete Horowhenua’s, if not with our more institutional repositories. In terms of their likely value, consider how the principle of distinctiveness that underpins these views on the ecology of sound meshes with having a strong indigenous culture that until as little as six or seven generations ago was exclusively oral, therefore predominantly aural, and had to cultivate strong listening disciplines. Thankfully, nobody needs to be convinced of the importance of promoting the use of te reo, but think of all the practices that could be documented in this way, enriching our sense of how they occupied or continue to occupy their environment. They are not the worst thoughts to entertain, at this time of the year. While the scientists fight to save it, Venice’s best friend is the photographer, whose art alone can do something to capture its incomparable bewitchments for all time. Time travel in Venice can be a little dull. Suppose you were transported back to 1972. How could you tell? Your cellphone of course wouldn’t work. Good luck sending an email or spending those Euros. And the fashions have changed, although not as dramatically as one might think. 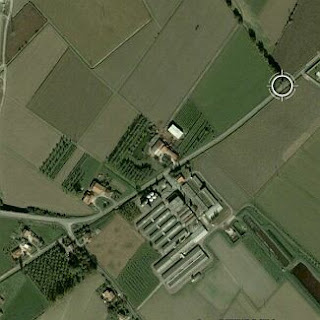 Let's say that you were teleported to Riva degli Schiavoni. Would the garb of these folks immediately capture your eye? The lady in red at the back of the top picture, perhaps. How about this couple standing in front of San Giacomo di Rialto? This young woman resting beside the Tetrarchs? I suppose that yes, you could tell, you would, by looking at the people, unless you happened to be transported during the Carnival, when Venice becomes even more of a period piece. But the buildings themselves haven’t changed appreciably for a very long time. Digital television dishes have flourished on the rooftops in the last ten years or so, but they too can be easily deleted in post-production, along with the power cables and the old aerials. Then, so long as you keep the motorboats out of the shot, you are left with Venice as it looked any time between the late eighteenth century and last Wednesday. Timeless and at the same time unique, Venice cannot play any city other than itself, but in that eclectic mix of styles and architectural influences lies also its ability to sublimate its own bloody history into an immensely appealing aesthetical form. Venice pioneered the most marauding forms of wealth acquisition, opening countless trade routes at the tip of a sword, or the blast of a cannon, or the threat of bankruptcy. The magnificent quartet of bronze horses that adorn the façade of its basilica are a spoil of the appallingly savage sack of Constantinople, but so too is Saint Mark himself, whose remains were abducted from a temple in Alexandria at a time when being in possession of such a relic could give a fledgling city its mana. Venice itself is a spoil. 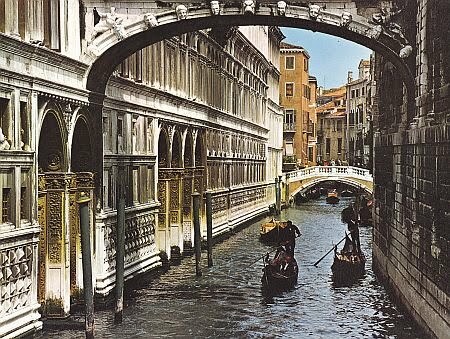 It may be the people that place Venice in time, but the place was never meant to be inhabited. The Veneti who repaired on the mud islets of the lagoon to flee Attila’s hordes did so out of desperation, and they resigned themselves to build permanent homes there only once it became clear they would not be able to recapture their old cities. Nowadays they are leaving again, driven out by a cost of living progressively inflated by the tourist dollar. At the end of last year the city had 270,081 residents, versus 363,540 in 1972 (source), a trend that suggests that Venice could die socioeconomically before it has had time to die hydrogeologically. By contrast, according to Euromonitor the city takes in about 3 million tourists a year. And since all of them at one point or other walk along the same two routes and narrow bridges, what one spends a lot of time doing in Venice is fending off people, standing in line with people, trying to get away from people. So why is it that when I look at an old photo of Venice, I’m interested in nothing else but the people in it? Maybe it’s because people are the opposite of timeless. 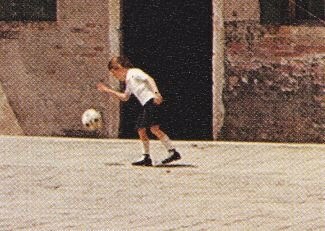 This little boy dribbling a football in Piazza della Maddalena must be in his early forties by now. I assume by the fact that he had a ball that he was a local - for who would take a football to Venice? - but looking at the population charts there is a significant chance that he has since moved elsewhere. 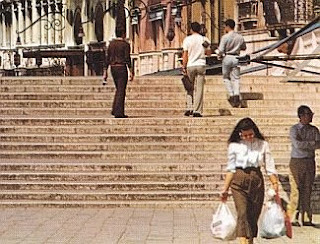 Whereas the Piazza is still there and I doubt that it has changed at all: timeless and constant, except for its slow sinking, along with the rest of the city, at the rate of several millimetres per year. 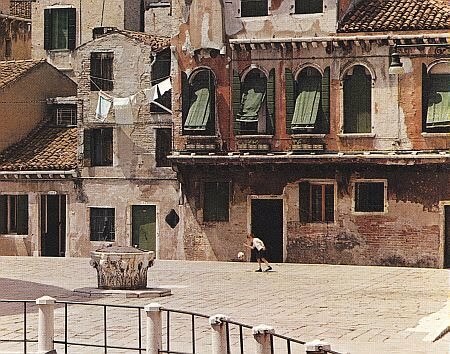 I’ve clipped the images in this post from a book called Venice in Cameracolour, first published by the London imprint Ian Allan in 1972. The photographs by F.A.H. Bloemendal that I've been scanning in search of human figures are standard postcard shots, unexceptional save for the quality of the colour plates transfer, that sets the book apart from others of the same era. Venice in Cameracolour almost looks in fact as if it could have been produced in 2010, which assists with the time-travelling business. 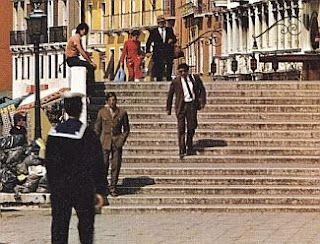 I also like to think that whilst working on the book Bloemendal might have bumped into Nicolas Roeg and his crew, who spent much of 1972 in Venice to film Don’t Look Now. Venice used to be the place where the great literary minds of Europe went searching for inspiration, to create the new - Byron called it ‘the greenest island of my imagination’. It is also the place where people go to get married, or on their honeymoon, crafting their memorable past-to-be. But existing as it does outside of conventional time, and being so unlikely and so unlike anywhere else, it’s also the place where people go to forget. For the characters played by Julie Christie and Donald Sutherland in Roeg's adaptation of DuMaurier’s short story, it is the latter: for while Sutherland's John Baxter, an architect, works to preserve the city’s material past by restoring one of its churches, the pair seek to put distance between themselves and their English villa, where their young daughter drowned. But her presence, that minute figure clad in a red coat, haunts them still - for how could it be otherwise. There isn’t a non-place on earth where you could find refuge from that. Venice doesn’t care about you, for it has no social texture - especially in the imaginary of foreigners. 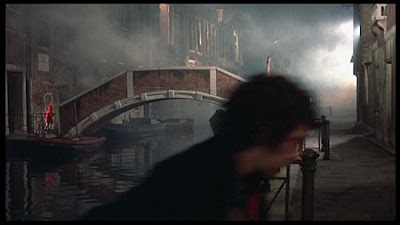 Roeg’s Venice, more so than Thomas Mann’s, more so than Ian McEwan’s, is the place where you lose yourself and start seeing people for what they are not. 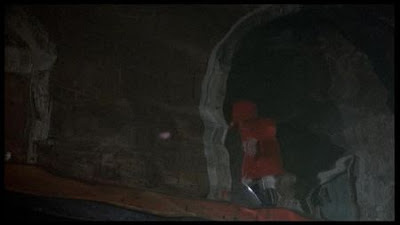 Sutherland's fatal chase of the red-clad figure at the end of the film - itself the ritual subject of multiple homages and remakes - is the fulfilment of a death wish, but it’s also an allegory of the death of the social. And what better place for society to die, than in Venice? F.A.H. Bloemendla and Anne G. Ward. Venice in Cameracolour. London: Ian Allan, 1972. 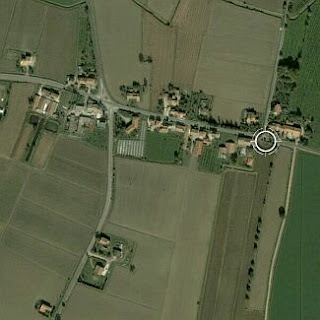 The fifth of July, 1982 was a Monday, and I was staying at my grandmother’s, in the countryside village of Villa Poma, for the early part of my Summer holiday break. My grandfather had died two years earlier and at around the same time a number of my local best friends moved, or were in the process of outgrowing my company. I had always been the youngest in the group, but suddenly I found myself on the wrong side of puberty; mostly gone were our group escapades, and completely gone were the night-time football games in the street in front of Nonna’s house, with a lamp-post and the bin for the recycled glass marking the only goal. And so I either went on solitary cycling excursions, often as far as Magnacavallo - a twelve kilometre round trip, past the railway tracks - or stayed indoors with Nonna, away from the fierce daytime heat. I would read or play while she busied herself around the house: it’s only some time later that I worked out that she was worried that people passing in front of our windows might see her idle, which - her socialist upbringing notwithstanding - she considered improper for a woman, even if the woman in question happened to be a widow well into her seventies. Occasionally I was able to convince her to hand my arse to me at briscola, which she did with scarcely contained glee, but the days were long. 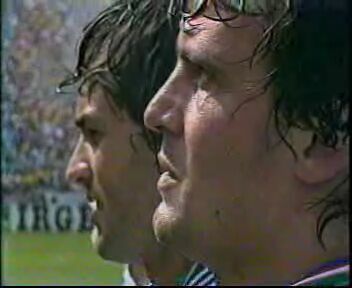 The fifth of July, 1982 was a very hot day in Villa Poma as it was in Barcelona. We played Brazil in the late afternoon, at the small stadium known as the Sarriá, and the players were already drenched in sweat before the game even started. Our players, that is: did the Brazilians even feel the heat? Did they sweat? You couldn’t be sure. What they did around the park hardly looked like effort - not for nothing they called it futbol bailado, a dance. A competitive dance, insofar as they still played to win, but the winning was a formality. They had only got into a spot of trouble in the opening game, against the Soviet Union, when their goalkeeper spilled an easy shot from long range, but they came back to win that one too, seemingly waiting until the last minute just so they could seal it with the perfect goal. The rest of their progress, including a conservative 4-0 tally against New Zealand, had been effortless, and effortlessly they dispensed of the hated Argentineans in the first game of the second round. Cerezo, Falcão, Eder, Socrates, Zico: you will not find a better midfield in the annals of football. And if they always seemed fresher and faster and stronger it’s also because they let the ball do the much of the running, with sublime passes that looked, yes, as if they had been choreographed in advance. On the fifth of July, 1982 I turned the television on at ten minutes past five and there they stood, lined up for the national anthems, looking like Martians. They had the superior song, the better looks, the greater confidence: in a game that they played for beauty, they won on aesthetic grounds alone, before the ball was even kicked. 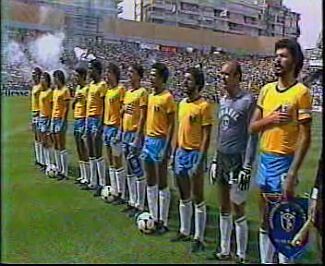 Has there ever been a footballer more handsome than the statuesque Socrates (first from the right)? Italy, on the other hand, was a shambles. A pallid copy of the exciting young team that had been the revelation of the 1978 tournament, where it placed fourth, it was a lacklustre group, unable to muster a single victory in the first round before finally finding enough vim to beat Argentina 2-1 in the second. Too little, too late, surely, to so much as bother Brazil, which thanks to its superior goal difference only needed a draw to advance to the semi-final. Not that it would matter to them, you suspected. 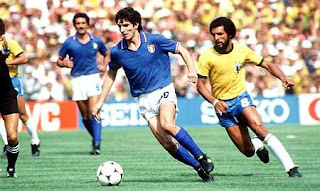 The Azzurri also carried extra ballast in Paolo Rossi, the striker whom coach Bearzot had taken on the expedition at the end of a long suspension for match-fixing, and who despite starting each and every game thus far had been totally, irritatingly ineffective, having developed an uncanny knack for finding himself in the wrong spot or mistiming the ball. And so it was that four minutes into the game he received an inviting cross from Tardelli that he intended to volley, but the ball spluttered perhaps one metre away, to the nearest golden shirt. It was going to be a long afternoon. On the counter, Brazil looked like it was just getting comfortable. A probing ball for Serginho was cleared by Conti, Collovati stopped it from crossing the line for a corner kick and passed it to Scirea. He was our fullback, the libero, and the ball invariably went through him whenever we started a play from defence. (A very classy player and person, he died tragically in 1989 in a car crash in Poland, while scouting players for his old club.) On this occasion he served the ball up to Conti, who after a one-two with Oriali took it into the Brazilian midfield, eluded Cerezo, dribbled Eder - who briefly considered giving chase, but didn’t - then found Cabrini on the opposite wing with a long aerial pass. Cabrini took two steps and crossed the ball into the box where Rossi glided in behind a pair of defenders and headed it into the net. Wait, what? Did we just score? Was it Rossi, of all people? We might be able to salvage some dignity after all. Make the Brazilians sweat a little. Or perhaps it will just make them angry. Watch out. Looking at the play now - thirty-five seconds of uninterrupted Italian possession, from one end of the park to the other, without much in the way of pressure on the ball carrier - one is struck by how much football has changed in terms of style and pace. It was handsomely done, anyhow. Observe. Back at the Sarriá, there was barely time to brace for the inevitable Brazilian onslaught that they had already drawn level: after Serginho missed a fortuitous chance alone in front of Dino Zoff, the Italian keeper, Zico sent Socrates galloping into the box with a beautifully angled through-ball, and the tall, bearded one finished it with a searing shot between Zoff and the post. The balance had been swiftly restored, but it would be disrupted again ten minutes later. Perhaps unaccustomed to being pressured in their own half, the Brazilians tried to clear the ball laterally instead of sending it downfield, allowing Rossi to intercept the pass and beat Valdir Peres from just outside the box. A less handsomely crafted goal than either of the ones that preceded it, but we’d take it. Belief began to creep in, not just in Barcelona, but in Villa Poma as well. If only we could hold them off until the break. If we could keep spending time in their half. If Gentile could neutralise Zico like he had Maradona in the previous match. If Zoff played the game of his already long and illustrious career. Nonna kept pottering while I started to timidly entertain these thoughts, and we did indeed reach the break with little more flutter to register than an imperious header by Socrates blocked with poise by Zoff. Early in the second half, more topsy-turvyness: it was the Brazilian midfield who enjoyed more of the ball, but it was ours that created the best chances, only to criminally squander them - with Conti and Rossi, our best players on the day, as the perpetrators. And then Falcão struck. Because it had to happen. Because you couldn’t seriously believe that they wouldn’t score at least a pair. Finally, because it was Falcão. Gathering a long pass by Junior, he watched as the space opened up in front of him before exploding a furious shot with his left boot from the edge of the box and into the net. The standard criticism of Brazil and coach Telé Santana at this point is that, with twenty minutes to go and a score line that would see them through to the semi-final, they didn’t change tactics, play with more circumspection, slow down the game. I wonder if that’s a fair charge. Whenever we had crossed the midfield, we looked like scoring, so why not keep the play at the other end of the field? Besides their further trouble didn’t come via a swift counter-attack. It was only five minutes after the equaliser that Antognoni won a corner, our first. Conti took it, the ball ricocheted to Graziani who fired a shot from just inside the box, and Rossi - yes, Rossi, again! - deflected it in. It was at this point I think that Nonna stopped her pottering, and sat down beside me to watch what must have been the only fifteen minutes of sport in her life. Whether it was because I had managed to convey to her the fact that something epic might be about to happen, or she had just gleaned it from the tone of Nando Martellini’s voice blaring from the television set, I’m not sure. Nor do I recall if I was sitting or standing or pacing around the room - I just remember the raw emotion, the ferocious concentration at the service of willing Fate: make it happen, please, just make it happen. I consider myself genuinely lucky to have had that, at eleven years of age, and perhaps Nonna was too, at seventy-five: a moment to be enjoyed with total belief, as if the naïve nationalism of it, the use of that pronoun - us - that I’ve made throughout this post, made actual sense. In those symbols, in those differently coloured shirts, the two of us chose at that time to believe, and we suffered - as we watched Zoff make that save - but then the referee’s final whistle brought us joy, and there are no other adequate descriptors for those emotions, even though we should have known better, even then. We had won. I watched the game again for the first time two or three years ago, a quarter of a century after the fact, and found that the original narrative had faded somewhat. Brazil wasn’t all that fearsome on the day. Far from being under constant siege and launching the occasional counter-attack, which is how I remembered the game, Italy more than held its own, carried the play with flair for long periods of the game, had the best chances overall, and even appeared to score a legitimate fourth goal via Antognoni, but for a dodgy offside call. It was a game between two closely matched groups of athletes, and it was the team in blue that prevailed. Yet that other narrative, the one in which we battled impossible odds against an invincible team of Martians - a mystique made possible in part by the fact that only Falcão played in Europe at the time - is to this day what makes the game so special, so memorable. And both sides bought into it: so much so that in Brazil the game is commemorated to this day as the tragédia do Sarriá, the tragedy of the Sarriá. A historical defeat worthy of a day of national mourning. Football has changed a lot since then. It’s played faster, harder and more often; it is filmed from a myriad more angles and under better lighting conditions; it attracts far more money, is pervasively corporatised and casts a wider and tighter global net: players from all over the world are scouted as teenagers and delivered to Europe at the slightest hint of promise. It is also seemingly more conscious of its own myth-making and of its value as a commodity: no sooner a game is over that its highlights are replayed in slow-motion with the accompaniment of a suitably emotional soundtrack; no sooner a major tournament is over that it is as available as a commemorative series of DVDs. And yet the game struggles to recapture those old narratives, that mystique; it struggles for the poetry that could bring together an eleven year old boy and his elderly grandmother. They were always fictions, things we chose to believe, not to mention things that distracted us from real struggles, I suppose - old fashioned circenses. But there was something real about them too. Weren’t the players grown-up versions of the kids who played on our street, with a lamp-post and a bin to mark the goal, fantasising about Zico? And wasn’t there art in their moves, isn’t there still? And so from end of this week I will duly sit down in front of another World Cup - the first one in Africa, no less - get Joseph out of bed when Italy and New Zealand are due to play, school permitting, and I hope it will be as enjoyable and memorable for him as it was for me. We’ll see how it goes. This just came to hand: a k-punk post from 2006 on the slogan for ITV's coverage of the World Cup, "let the memories begin" and the wonderful premediation of it all. Best commentary I've come across on the Zidane-Materazzi incident, too.